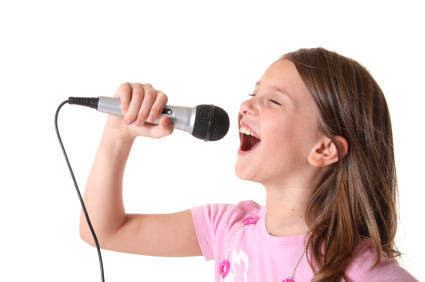 As Spotlight is a stage school not just a dance school we also have weekly lessons in Singing in Birmingham. These classes cover a wide variety of musical styles from Musical Theatre to Pop. All lessons include vocal warm-ups and technique exercises before working on set songs. There are both choral and solo opportunities and an annual performance for parents. In addition to the annual show, Spotlight singing students have performed in spectacular large-scale concerts at Wembley Arena and the LG Arena. They have also secured numerous West End roles including Veruca Salt in Charlie and the Chocolate Factory and Bruce in Matilda. Voice coaching has also helped many of our Birmingham pupils gain roles in UK tours of professional musicals including Oliver!, Miss Saigon, The King & I, Gangster Granny, Brassed Off, Nativity the Musical, Joseph and the Amazing Technicoloured Dreamcoat, South Pacific, Carmen, Aida, Once Upon This Island, as well as numerous amateur dramatic performances of hit musicals. Pupils have also sung on national television on the Junior Stars in the Eyes Final. Spotlight pupils have done well in international singing competitions winning 4 world titles and 2 silver medals for Song & Dance numbers in the last 3 years. Pupils in Birmingham who want to gain qualifications in Singing can take additional 1-2-1 lessons to prepare for government-recognised exams with the London College of Music (LCM). We have an excellent pass rate with nearly all pupils achieving the top Distinction mark. Nathan Parkinson holds the record for the Highest Mark in the Midlands region and was rewarded with a special trophy to mark his achievement.